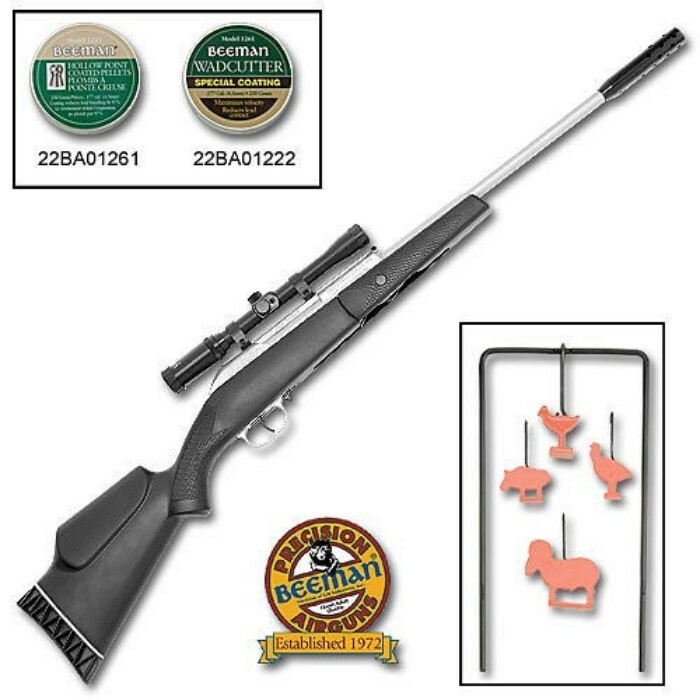 Beeman Hunters Air Rifle Kit | BUDK.com - Knives & Swords At The Lowest Prices! Take your shooting skills to the next level with this top-quality Beeman Hunter's .177 Caliber Air Rifle kit, complete with pellets and silhouette targets for hours of fun, right out of the box! Features include a composite Monte Carlo stock with an ambidextrous cheek piece, a sporting-grade trigger, a professionally mounted 4x20 wide angle scope and automatic safety. The realistic weight, precision rifled steel barrel and ported "Muzzle Break" feature provide enhanced accuracy & ease of cocking. You will not regret it whatsoever. Going to upload a video soon with it, and I will write another review and post it!